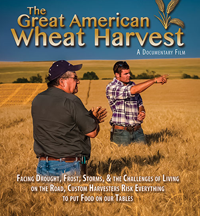 LAWRENCE — The Dole Institute of Politics at the University of Kansas will host a screening of the documentary “Great American Wheat Harvest,” followed by a Q & A discussion with filmmaker Conrad Weaver and custom harvesters Jim and DeeAnn Deibert. The event will take place at 3 p.m. Dec. 4. It is free and open to the public, and refreshments will be provided. The “Great American Wheat Harvest” is a documentary that tells the story of hard-working custom harvesters who travel from the heart of Texas to the Canadian border harvesting the wheat that feeds the United States and other countries around the world. The film is produced by award-winning director and producer Conrad Weaver, president of Conjostudios, LLC. The film shares the challenges that are now threatening this way of life, passed on from generation to generation, through the stories of three custom harvester crews. Much has changed in farming and harvesting from a historical perspective, and Weaver felt that it was important to document the lifestyle and heritage of these family businesses before it is lost. Weaver is an award-winning video producer and is president and owner of Conjostudios, LLC. His work has been recognized nationally with a recent Silver Telly Award for a promotional video for the “Great American Wheat Harvest.” He also won a Bronze Telly Award for his “Frederick Rescue Mission Food Services” video. He has previously received Telly Awards for two other projects. Weaver is an advocate for agriculture and calls himself an AgVocate. His interest in agriculture comes from his background growing up on a small dairy farm in northeastern Ohio. Weaver spent summers working on his grandfather’s farm and has a number of family members who still farm today. Jim and DeeAnn Deibert are custom harvesters from Kansas whose harvesting crew is highlighted in the documentary film. The Dole Institute of Politics is dedicated to promoting public service, civic engagement and politics. It is located on KU’s west campus and, in addition to the Robert J. Dole Archive & Special Collections, offers free public programming with world-renowned guest speakers on a variety of topics that intersect politics, as well as research, gallery visit and other interactive opportunities for students of all ages.